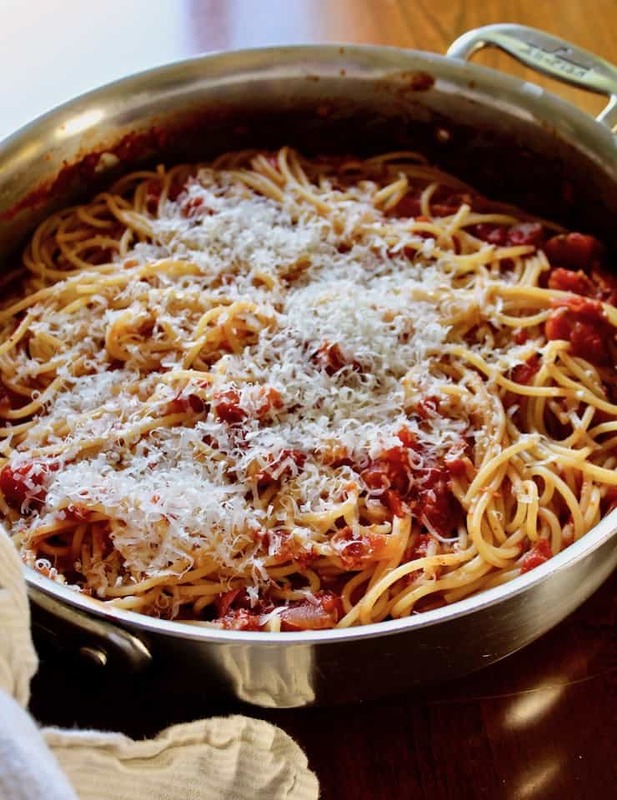 Spaghetti with Bacon Sauce, simple and rustic version of the Italian classic all’Amatriciana, adapted from my dad’s Romeo Salta cookbook. I grew up in the 70’s with a father who was an amazing cook. He used to make a spaghetti with bacon sauce that I loved. 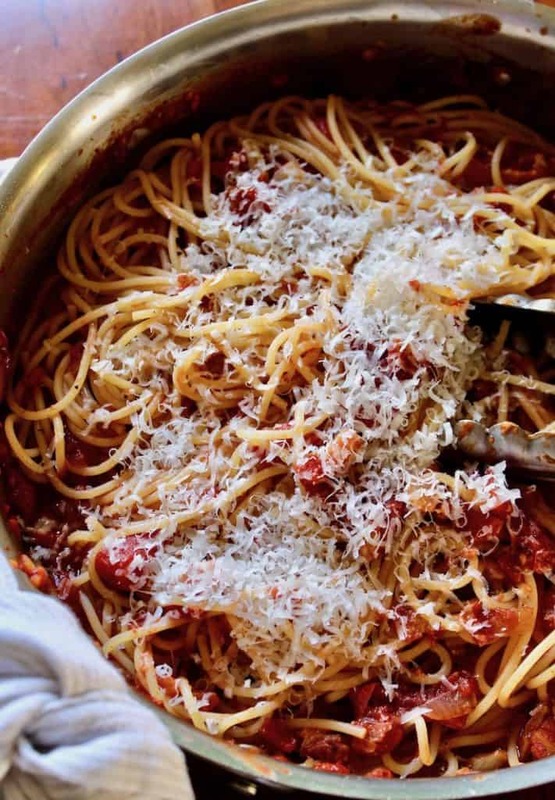 If I came home from school and asked what’s for dinner and was told this spaghetti, I could hardly wait to eat. It was so good and there was lots of slurping at the table, everyone trying to get every last bit of sauce. I’ve asked my mom if she remembers how dad made this and she always says she has no idea. So, like so much of my dad’s cooking, I have only memories. Recently a package arrived in the mail from my mom. She was going through my dad’s many cookbooks and found the one with the spaghetti with bacon sauce recipe! 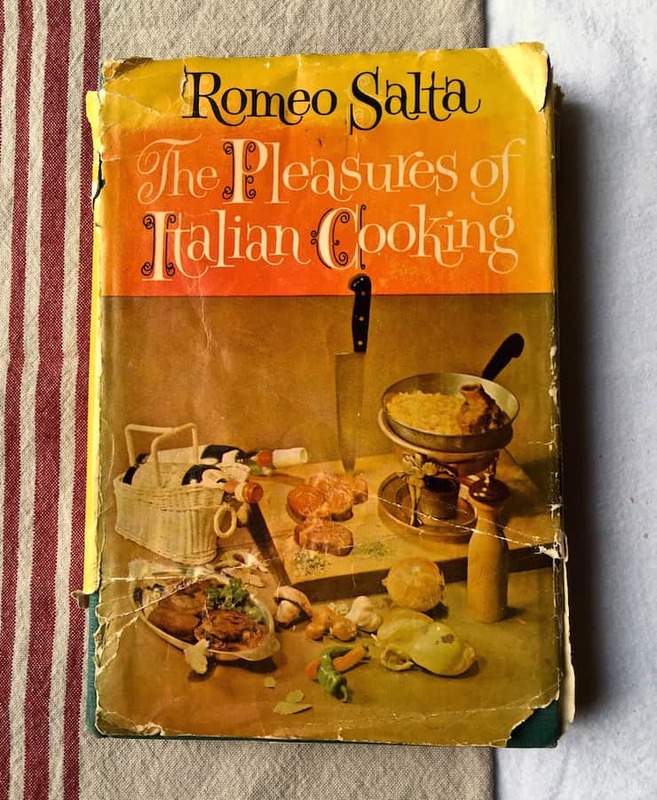 It’s from The Pleasures of Italian Cooking, by Romeo Salta. And it’s signed by Romeo and also has some handwritten notes from my dad. How cool is that?!? I did a little research on Romeo Salta. He is largely credited with starting the fine Italian cooking movement in the states and became quite the celebrity chef. His namesake restaurant in New York had a stellar reputation, with many dishes cooked tableside. He was also known for his simple, authentic and honest Italian cooking. 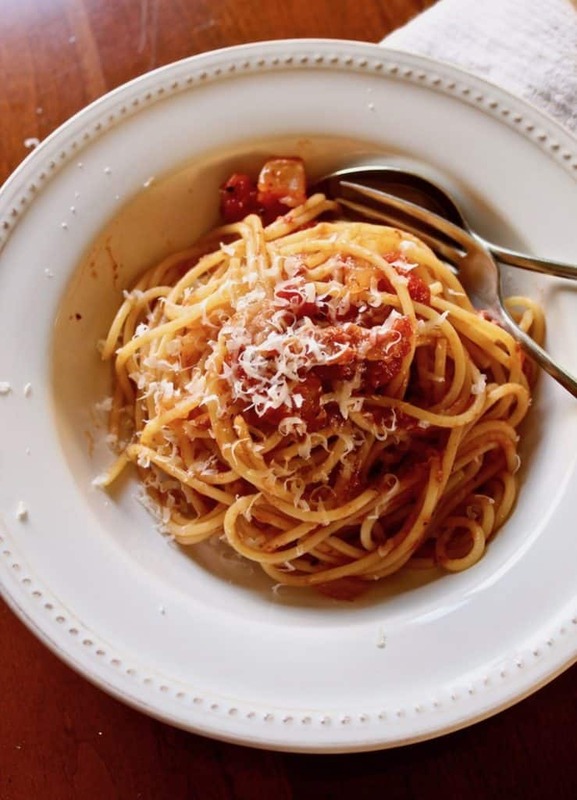 This dish is called Spaghetti all’ Amatriciana, or spaghetti with bacon sauce. I’m pretty sure my dad made it with canned tomatoes. I used fresh roma tomatoes and my sauce wasn’t as “thin” as my dad’s. The sauce also has some bacon, onion and white wine along with the tomatoes. 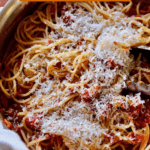 It’s topped with grated Pecorino or Parmesan cheese. Simple and so good. You might also like this baked spaghetti dish from my great grandfather, adapted from an Italian restaurant in Chicago. If you’ve tried these Apple Slices or any other recipe on the blog, then don’t forget to rate the recipe and let me know how yours turned out in the comments below ~ I love hearing from you! You can also FIND ME on FACEBOOK, TWITTER, INSTAGRAM and PINTEREST. Never miss a post ~ sign up for The Hungry Bluebird Newsletter for a weekly email of new content. 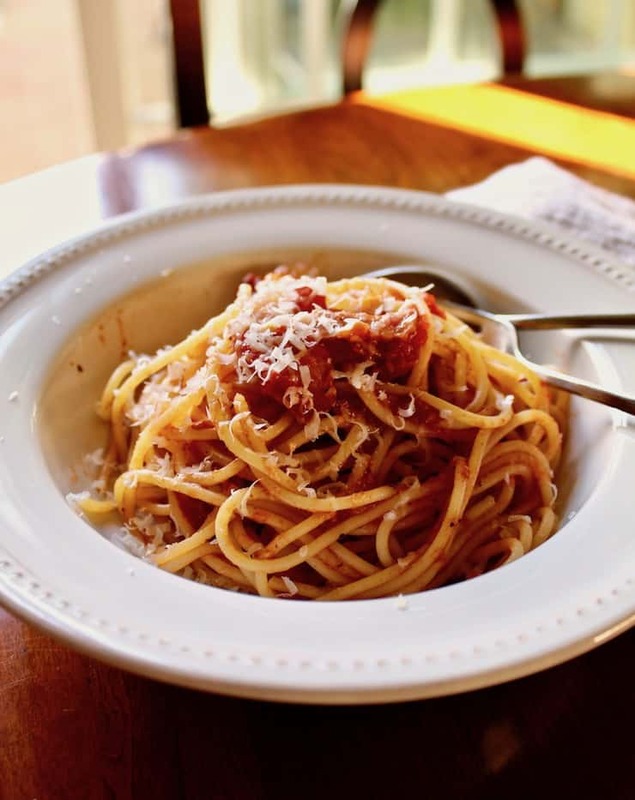 Spaghetti with Bacon Sauce, simple and rustic version of the Italian classic all'Amatriciana, adapted from my dad's Romeo Salta cookbook. In a large sauce pan, cook the bacon and onion until lightly browned. Add the wine and cook until almost evaporated. Add the tomatoes, black pepper and pinch of crushed red pepper. Stir to combine and simmer on low for 20 minutes, stirring occasionally as the tomatoes release their juices. Taste for salt and pepper. Meanwhile, cook spaghetti in salted boiling water until al dente. Reserve ½ cup cooking water, drain pasta and add to the saucepan with half the grated cheese and toss to combine well. Add reserved pasta cooking water if it seems too thick. Sprinkle with remaining cheese and serve. 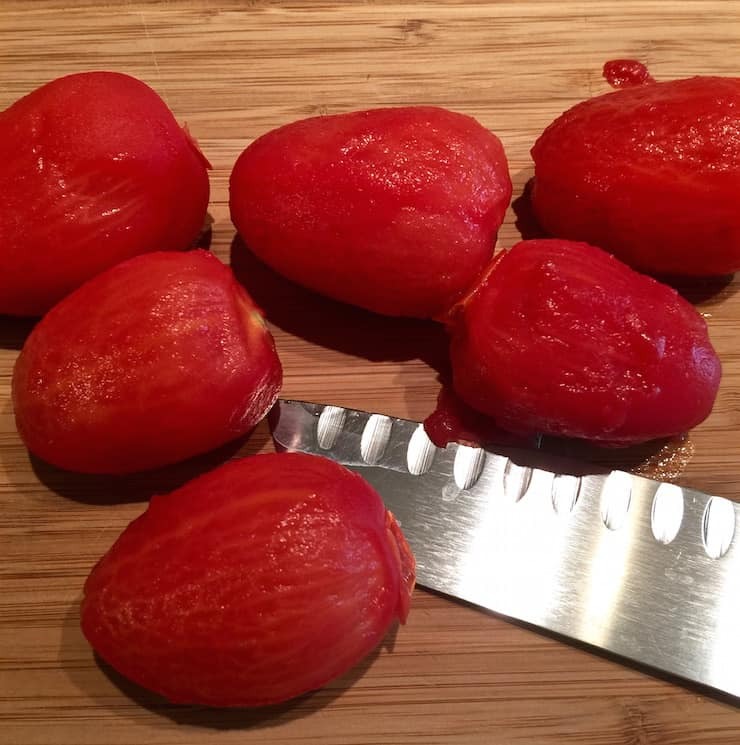 To peel fresh tomatoes, drop them in boiling water for about 1 minute. Remove to a colander, skins should easily peel off with a small paring knife. 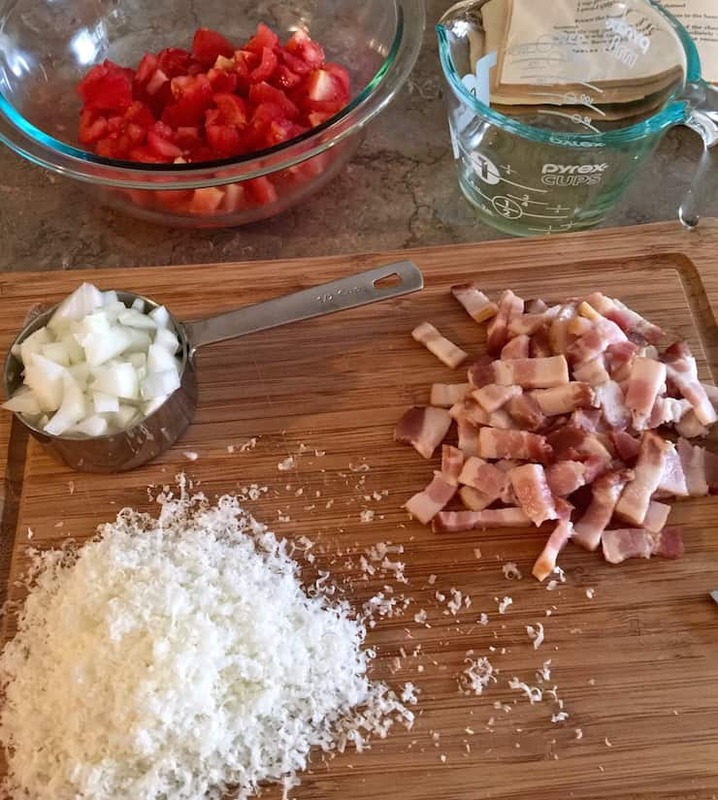 For a more authentic Amatriciana sauce, use guanciale or pancetta (about 4 ounces, thinly sliced and then roughly chopped). I’m not sure which I love more ~ This amazing looking pasta or the story that goes with it ~ it touched my heart. Wait ~ the pasta won because it touches my stomach which always comes first 🙂 You’re such a natural storyteller ~ humorous and heartfelt and I crack up at your “pet names” for your family in all your posts. I’m I think we’d get along really well. Thanks for sharing your memories. Have a great day! Bernie, thank you so much! Too sweet. I enjoy A Gouda Life very much, and yes, I think we’d get along splendidly…good food and a little wine always. BUCATINI ALL’AMATRICIANA except you would use pancetta, which is unsmoked Italian bacon with juniper and pepper, I tried it with regular bacon and loved it.